Ships from and sold by HongYHE. The collar does not stretch itself, please make sure leave ONLY 2 fingers between collar and dog neck. A properly fitting collar and harness won't leave any room for your dog to chew. To make a safe and fit purchase, always look at the size chart for the recommended weight range to confirm the size. The collar is not for tie out, NEVER leave your dog unattended with a collar on. 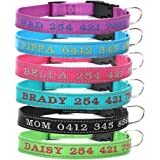 The personalized collars help ensure the safety of your pet if they wander off or get lost. All buckles are made from ecofriendly plastic. 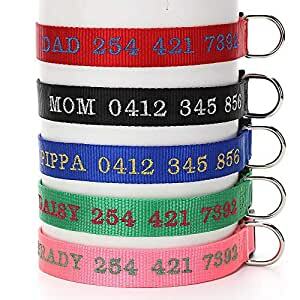 Pet’s name and phone number will be embroidered on different pattern collar, and embroidery range of dog collar is limited. Please pick your EMBROIDERY COLOR (FONT COLOR) and enter EXACT TEXT you want to display on the collar. We have 9 font colors for your choice: Black, White, Green, Blue, Red, Gold, Pink, Orange, Dark Blue. The beginning of the first embroidery character will be relatively fixed ,and sometimes the name/ numbers will be tuck into if you adjust this collar with different length, that does not affect normal use. We are open to customers' voices; Don’t hesitate to contact us for more details. Due to different computer monitors/calibrations, colors may vary slightly from the picture, but all pictures are taken with production samples. To determine the correct collar size for your dog, use a soft tape measure or piece of string and wrap it snugly around the base of your dog’s neck – snug enough so that you cannot fit any fingers under the measuring tape. Your pet’s measured neck size must fit within the collar’s adjustable length range. For instance, if your dog’s neck measures 13" inches order an 11"-16" inch adjustable collar. - S: Adjustable: 13.8"-15.7"(35-40cm),Width: 1"
- M: Adjustable: 17.7"-19.7"(45-50cm),Width: 1"
- L: Adjustable: 21.7"-23.6"(55-60cm),Width: 1"
- XL: Adjustable: 25.6"-27.6"(65-70cm),Width: 1"
Great fit but the print was a little messed up but you can still read the name . Would buy another !